Microblading is a brow tattoo that utilizes advanced Micropigmentation techniques to place precise hairstrokes of pigment into the shallow layers of the Dermis. The results are very natural looking and no one will believe it's not real hair! It is the perfect solution for thin or over-plucked brows or for anyone who just wants perfect brows without pencils or make-up. It is semi-permanent and requires touch-ups every one to two years after initial application. This is an ART, and we work hard to create and shape brows that look natural and frame your face as well as select and mix colors that are perfect for your hair & skin tone. It is semi-permanent and requires touch-ups every one to two years after initial application. Powder Brows are also a trending type of permanent make-up, where through the process of inserting pigment into the upper layers of skin, We create the desired fullness and design of the eyebrows. The effects will be waterproof, smudge-proof and completely realistic. It lasts longer than Microblading, typically requiring a touch-up every 2 or 3 years depending on the client's skin type, lifestyle and various other factors. MircoBlading or Powdered Brows : $350-$500 Microblading & Powder brows typically take 2 treatments, one initial and one touch up at 6 weeks. There is a possibility that you do not need a touch up at 6 weeks. Eyeliner: Lash line enhancement is a shading in the lash line for a thicker appearance of eyelashes. Call it a barely-there eyeliner. For those who don't want to look like they have any makeup on, a lash line only enhancement is perfect for you. It will simply make it appear that your lashes are thicker and darker as opposed to a full eyeliner look. Light enhancement is very popular with men as well. Many actors and male models have it done as well as ordinary guys who just want their eyes to stand out! Traditional Eyeliner will make you feel like you always have your game face on! Eyeliner is the easiest way to enhance the beauty of the eyes, and we will draw on your eyeliner to the exact color and thickness you desire before starting the procedure. We use top of the line numbing creams to insure your comfort throughout the time we are working on the delicate eye area. Many clients initially seek treatment as they are not happy with the symmetry, balance and/or color of their lips. 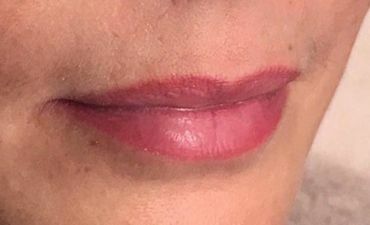 With the help of advanced Micro pigmentation techniques and devices as well as custom blended pigments to match the clients’ skin tone we can create very natural looking lips, with perfect shape and definition, delivering the results that you are looking for. LIP LINER/CONTOUR - Skillfully applied color will result in beautiful lips with definition, color and volume. In addition to these benefits the treatment can correct shape or symmetry concerns, and is a wonderful way to combat lipstick bleeding. LIP BLUSH - The most popular of our lip procedures. A definite outline to perfect your lip shape, with a subtle shaded colour to make your lips come to life! This procedure can be as natural or as bold as you wish, in a wide range of color choices. FULL LIP COLOR - Complete definition and color for your lips. The whole lip area is tattooed to create a fuller more colorful lip in a stronger shade which will decrease the need to constantly reapply lipstick.